I liked the first book, I loved the second one but I was disappointed by the third. Why? Because it felt contrived. It felt as if the author had ideas for just, say, one third of the plot and, for, some reasons, decided to stretch them into a fully-fledged novel. As a result the third part of Gen’s adventures, this time as a young ruler, bored me almost to DNF. The narration switched to another POV – that of a young officer in the Attolian army called Costis who gets entangled in schemings of the court. Costis is neither bright nor especially savvy so, for most of the time, he feels lost like a child in the fog. I think that particular character could have been developed into something good but once again, for some reasons he remained the same from the beginning to the very end, just changing his personal opinion about the new king after a while. Other characters seemed equally flat. Gen, even if he appeared from time to time like an omniscient demi-god who can decipher thoughts and intentions of everybody around him, spent half of the book in bed, recovering from wounds and the other half pretending his ineptitude. Which wasn’t especially funny. The villain of the story, Erondites, never made a strong appearance, and his conspirators were bland and completely forgettable. The plot dragged and dragged, meandering without any reason – somehow the author was compelled to describe every waking hour of Costis and the rest but didn’t progress beyond a period of three months. Perhaps it would work better if The King of Attolia was a middle book, preparing the reader for the finale grande but as a final chord it sounded weak. What a pity: a good YA series ends with disappointment, all good ideas dwindling to almost nothing. At least such was my private impression. 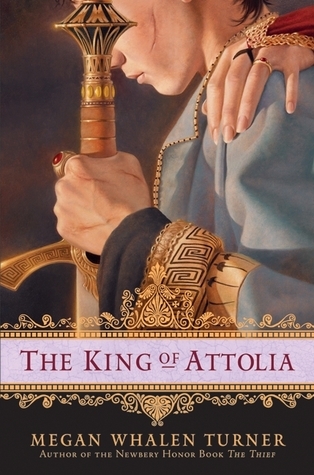 This entry was posted in adventure, book review, fantasy, historically-flavoured, meh, rating and tagged boring protagonists, megan whalen turner, meh, series alert, the king of attolia, YA. Bookmark the permalink. I agree, this is my least favorite book in the series and it feels like a throwaway. But there are still 2 more books after this! Awww boo. Bummer this was not what you wanted.